Experience two great New Orleans day trips in one with this 6-hour trip including Destrehan Plantation and an airboat swamp tour. Visit the oldest documented plantation in the lower Mississippi Valley followed by an exciting ride in a 16-passenger airboat. Get picked up at your hotel in New Orleans to begin this combination day tour, which lasts a little more than 6 hours. 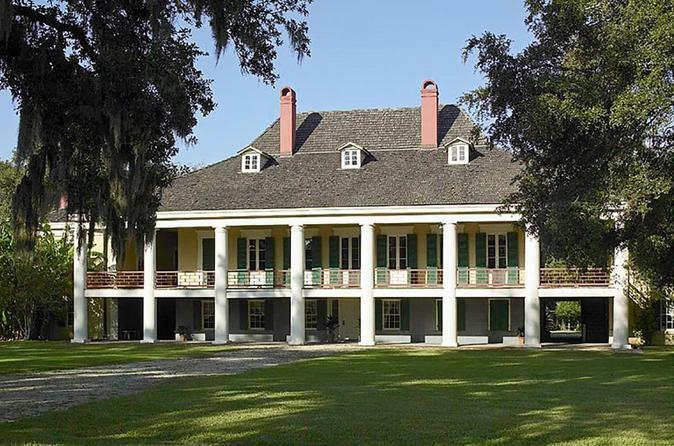 First, visit the Destrehan Plantation, built in 1787 and listed on the National Register of Historic Places. Travel through time from the French and Spanish Colonial periods through the Antebellum grandeur of the sugar barons to the ravages of the Civil War and the rebirth of reconstruction. You will find yourself immersed in the rich history of Louisiana when French was the language, and the white gold of sugar drove the economy. An 1811 slave revolt museum/cabin is on the grounds along with its massive oak trees. Family stories of those free and enslaved set against the fabric of history will intrigue every visitor to the site. A house tour is approximately 1 hour, with time to walk the grounds and see the slave cabin. This includes time for lunch (own expense) if time permits. Next, head for the swamp that's only 35 minutes from New Orleans - yet a world away. An airboat adventure is a high speed adventure that is part tour and part ride. You will experience the best of both: a swamp tour and an airboat ride. You will travel at high speeds in the airboat then slow down and stop for pictures. Along the way, you will get a personal tour by your local captain. The airboats have stadium seating, so that the person in front of you does not obstruct your view. So every airboat seat is great for experiencing the tour and viewing the wildlife. Yes, gators will get close - real close. So close that you will be able to look into those reptilian eyes. Alligators do hibernate in the colder months, but the experienced captains know where to look for them. On average, during the winter, you have better than a 50/50 chance of seeing a gator. In the warmer months, you will see a gator. Every airboat tour is unique and you never know what will be around the next corner. The area toured is a combination of swamp, marsh and lake, so you may see anything from a bald eagle to a pelican to osprey to an owl. The airboats are driven by a 454 Chevy Engine that will produce speeds of up to 35 miles an hour. They are propelled by a huge fan that will blow air from the back of the boat in excess of 200 miles an hour. These tours are truly a blast! They ride in inches of water and go where traditional boats cannot go. The boats were designed to take you to inaccessible areas of the swamp, places that you cannot reach by foot or car. It is a unique experience.